Miller Zambrano is a professional in geosciences with three and a half years of experience in structural geology and seismic interpretation. He holds a BSc. Geophysics Engineering from Universidad Central de Venezuela (Caracas, Venezuela) and a Diploma in Firefighting from the same university. Mainly, he has developed his work in the Venezuelan offshore area locating and characterizing structural and stratigraphic oil opportunities. Additionally, this job has permitted him made some contributions to the understanding of the Geodynamics in the Caribbean area. 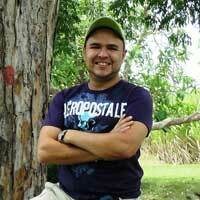 Concerning the laboral experience, he works for PDVSA as a seismic interpreter. Moreover, he has worked for Universidad Central de Venezuela as a teacher assistant and Metro de Caracas in costumer services. Now, he is integrating in the Reservoir Characterization Project. The area of his studies will consist in structural geology in carbonate rocks and reservoirs characterization at South Italy.